The E6 electric car is among the models BYD plans to introduce in Europe. SINGAPORE (Bloomberg) -- BYD Co., the Chinese automaker backed by billionaire Warren Buffett, may set up its European headquarters in Germany, the company said today. “Germany is the preferred location,” Henry Li, general manager of BYD's auto export trade division, said in a telephone interview. The decision depends on BYD “finding the right property and place” and will likely be made before the end of the year, Li said. Shenzhen-based BYD plans to start selling electric and hybrid cars in western Europe next year and become the first Chinese company to market alternative energy-powered vehicles in the region. 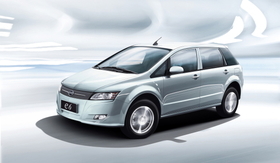 The E6 electric car is among the models BYD plans to introduce, Paul Lin, a company spokesman, said in March. The carmaker, part-owned by Buffett's Omaha, Nebraska,-based Berkshire Hathaway Inc., may eventually design and build cars in Europe, he said. BYD signed an agreement with Daimler AG to develop electric vehicles in China last month. Daimler, the world's second-biggest maker of luxury cars, and BYD will invest 600 million yuan ($88 million) in the equal partnership as it expands in the world's largest auto market.